Jupiter may be the biggest planet, but it sure seems to get picked on. 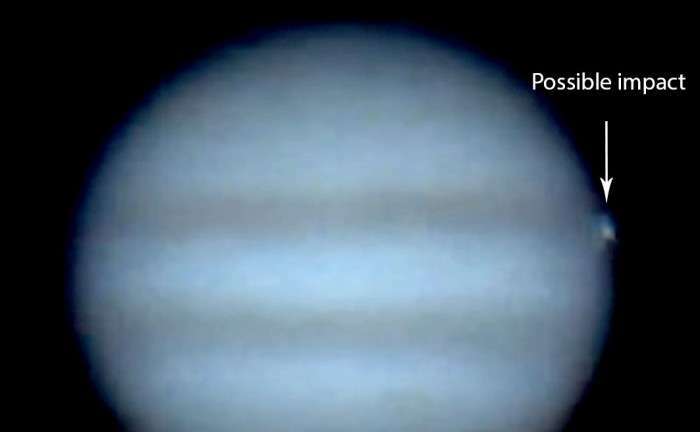 On March 17, amateur astronomer Gerrit Kernbauer of Mödling, Austria, a small town just south of Vienna, was filming Jupiter through his 7.8-inch (200mm) telescope. 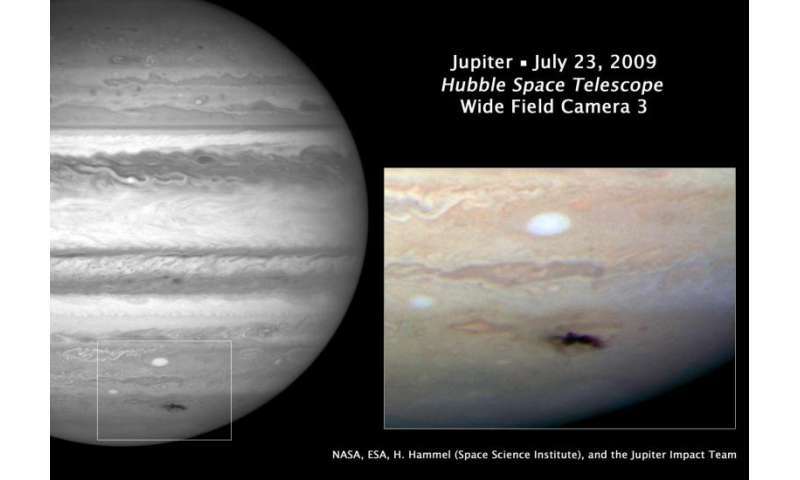 10 days later he returned to process the videos and discovered a bright flash of light at Jupiter's limb. "I was observing and filming Jupiter with my Skywatcher Newton 200 telescope, writes Kernbauer. "The seeing was not the best, so I hesitated to process the videos. Nevertheless, 10 days later I looked through the videos and I found this strange light spot that appeared for less than one second on the edge of the planetary disc. Thinking back to Shoemaker-Levy 9, my only explanation for this is an asteroid or comet that enters Jupiter's high atmosphere and burned up/explode very fast." The flash certainly looks genuine, plus we know this has happened at Jupiter before. Kernbauer mentions the first-ever confirmed reported comet impact that occurred in July 1994. 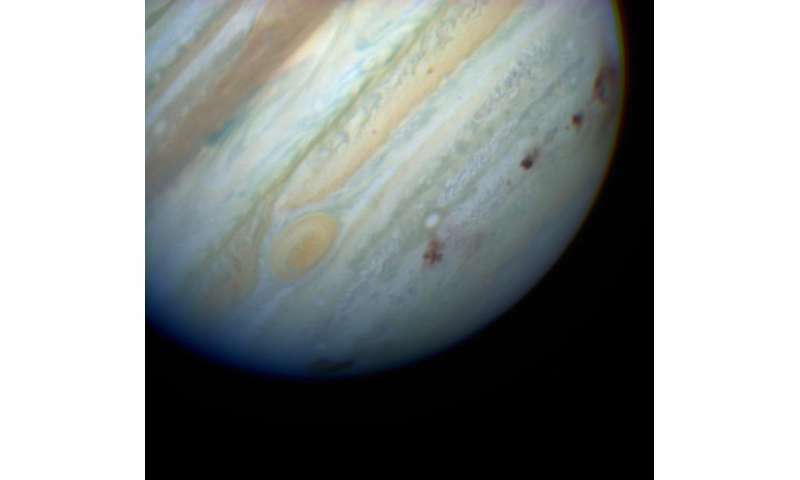 Comet Shoemaker-Levy 9, shattered to pieces from strong tidal forces when it passed extremely close to the planet in 1992, returned two years later to collide with Jupiter—one fragment at a time. 21 separate fragments pelted the planet, leaving big, dark blotches in the cloud tops easily seen in small telescopes at the time. With the advent of cheap video cameras, amateurs have kept a close eye on the planet, hoping to catch sight of more impacts. Two factors make Jupiter a great place to look for asteroid / comet collisions. First, the planet's strong gravitational influence is able to draw in more comets and asteroids than smaller planets. Second, its powerful gravity causes small objects to accelerate faster, increasing their impact energy. According to Bad Astronomy blogger Phil Plait: "On average (and ignoring orbital velocity), an object will hit Jupiter with roughly five times the velocity it hits Earth, so the impact energy is 25 times as high." Simply put, it doesn't take something very big to create a big, bright bang when it slams into Jove's atmosphere. It wasn't long before the next whacking. 15 years to be exact. On July 19, 2009, Australian amateur Anthony Wesley was the first to record a brand new dark scar near Jupiter's south pole using a low-light video camera on his telescope. Although no one saw or filmed the impact itself, there was no question that the brand new spot was evidence of the aftermath: NASA's Infrared Telescope Facility at Mauna Kea picked up a bright spot at the location in infrared light. 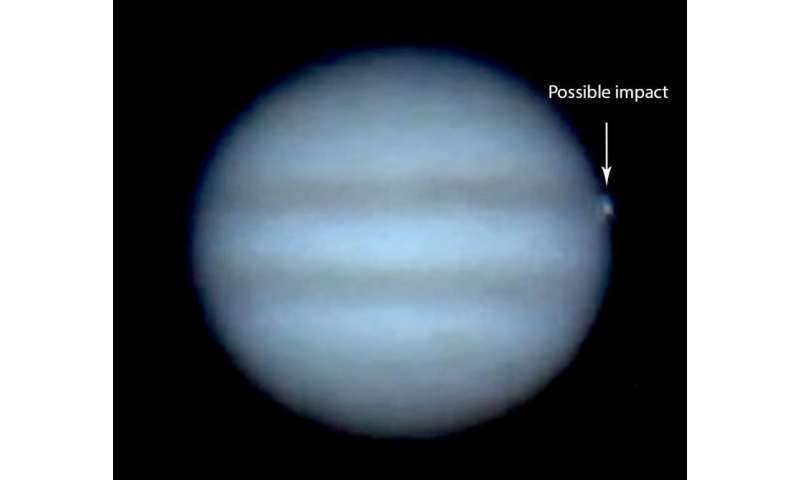 Prior to this month's event, amateur Dan Petersen visually observed a impact flash lasting 1-2 seconds in his 12-inch (30.5 cm) scope on September 10, 2012, which was also confirmed on webcam by George Hall.